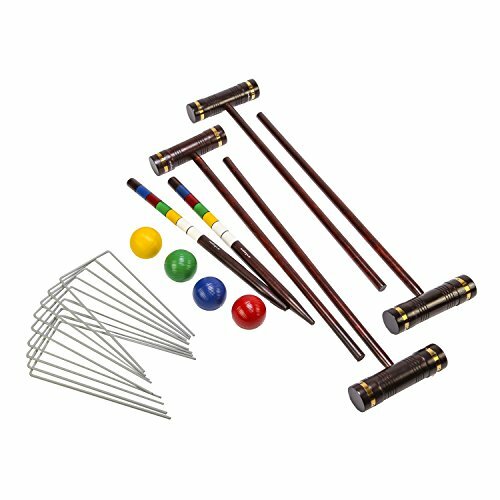 The perfect addition to your next backyard get-together, the Kelsyus Premium Croquet set comes with four solid wood mallets with 32 inch handles, and each mallet has metal inserts and threads to eliminate stripping. Layout your game with the included nine all-weather wickets and two solid wood 24 inch winning poles. There are four quality all-weather competition size croquet balls per set. Each set comes in a high quality carry bag for easy storage and portability. If you have any questions about this product by SwimWays, contact us by completing and submitting the form below. If you are looking for a specif part number, please include it with your message.